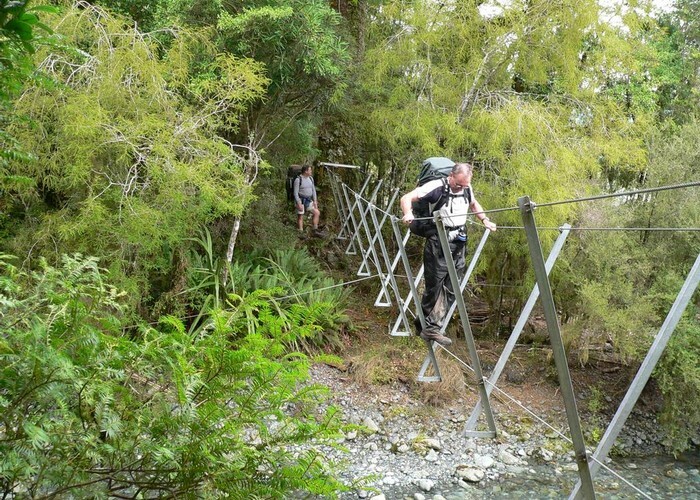 The Hollyford Track is a classic lowland Fiordland route from the Hollyford Road out to the coast at Martins Bay. Lake McKerrow • By Yarmoss. The long track is 4 days in each direction, with many parties opting to arrange a flight back from the airstrip at Martin's Bay. Transport to the road end is also available. Returning via the Pyke - Big Bay Route is a more challenging return option and is not suitable for most parties. 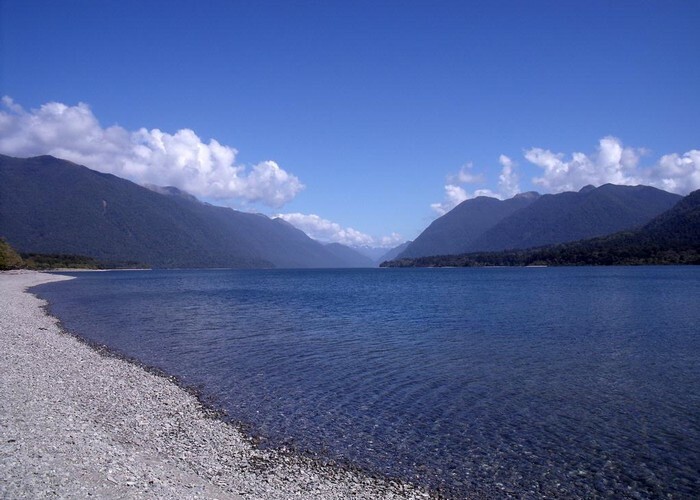 THE THE DEMON TRAIL • By Mike B. Licence: C.
The route is presently threatened by the Haast-Hollyford Road proposal, a plan to build a toll road along the coast, and reduce driving time to Milford Sound. The 16km Lower Hollyford Road leads past Gunns Camp and down to a shelter by the Humboldt Creek Swingbridge. 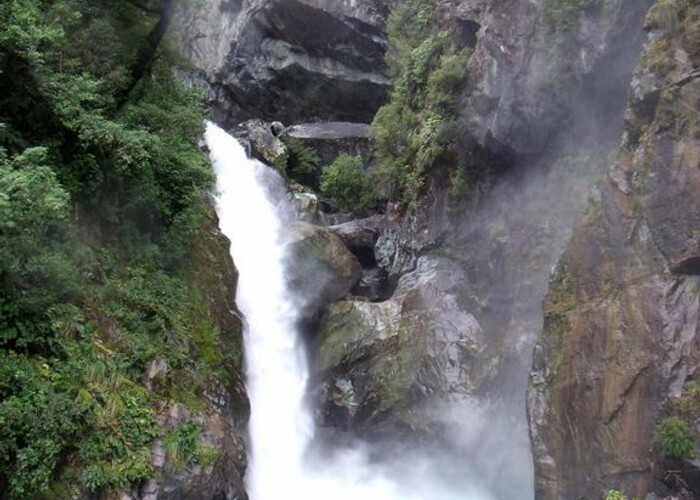 A short walk here leads to a view of the 275m Humboldt Falls. From the road end car park, the Hollyford Track crosses the swingbridge and follows the course of an old road, heading north at the edge of the Hollyford River flats. The track passes private Sunshine Hut at Hidden Falls Creek, and crosses a swingbridge. The hut is nearby. Hidden Falls Hut • Serviced Hut (DOC). Capacity: 12. From Hidden Falls Hut, the track heads north at some distance from the river to cross Little Homer Saddle, the track's high point at a modest 143m. Dropping past Little Homer Falls, the track returns to the riverside and passes the private Pyke Lodge. Passing a swingbridge over the Hollyford, the track leads on to Lake Alabaster Hut at the southern end of the lake. Lake Alabaster Hut • Serviced Hut (DOC). Capacity: 26. From here, the Pyke - Big Bay Route continues around the lake, but the Hollyford Track returns to the swingbridge and crosses the Hollyford River. A rough and muddy track follows the river around the western flank of the Skippers Range. McKerrow Island Hut is situated on an island between over a flood channel of Lake McKerrow. McKerrow Island Hut • Standard Hut (DOC). Capacity: 12. From here, the notorious Demon Trail leads around the eastern shore of the lake. This is an old cattle trail, a rough route with a number of three-wire bridges crossing creeks off the Skippers Range. Demon Trail Hut is situated near the southern end of Lake McKerrow. Demon Trail Hut • Serviced Hut (DOC). Capacity: 12. The Hidden Falls • By Yarmoss. The Demon Trail continues along the lake, eventually coming to the new Hokuri Hut near the northern end of the lake. Hokuri Hut • Serviced Hut (DOC). Capacity: 12. The track crosses Hokuri Creek either near the mouth or, in wet conditions, at the wire bridge 20 minutes upstream. The track passes the site of Jamestown on the lake shore. Jamestown was built 1870 and consisted of a hotel and about seven houses. However, supply vessels could not get over the bar to Lake McKerrow, so the colony failed. The town was abandoned by 1880. Martins Bay Hut • Serviced Hut (DOC). Capacity: 20. Finally, it launches across flats, past private Martins Bay Lodge and airstrips to the mouth of the Hollyford River and Martins Bay Hut. From the hut, a trail leads around the headland to Long Reef and beyond. The ​Pyke - Big Bay Route returning from Martins Bay Hut to Lake Alabaster Hut is a challenging return options of 20-29 hours, 68km. There are 2 huts. Flooding on this route is a common occurrence making travel impossible. Added 1 June 2001 by MatthewMatthew. 3 revisions, most recently 13 July 2017 by MatthewMatthew. 571 views in the past year (48 per month).